This blog captures thoughts of a very idle mind. I make no guarantees about what is posted here. You may be lucky and find something interesting or then again, you might not. If you’re interested in receiving updates, you can click on the “Subscribe” button above and you will then receive new blog posts as they occur. For those that care, I let people know about new posts through linkedin.com, which in turn updates the world via Twitter. You can follow me on Twitter at 12Knocksinna. I promise not to clutter up your Twitter feed too much as I usually just use it to send updates when I have new blog posts or some news that I consider valuable. I never really had much time to blog about interesting topics or anything else when I was working at HP, but since I retired from full-time corporate life in March 2010 I have more time to contemplate issues such as the evolution of email (especially Microsoft Exchange Server), travel in Ireland, France, and elsewhere, or any other topics that I like to write about. I still do some consulting to help companies figure out issues of a strategic nature – not being very technical, I can’t really solve all the deep and dark technical issues for companies, but I have a great ability to ask annoying and pertinent questions. My last book project was Microsoft Exchange 2013 Inside Out: Mailbox and High Availability (Microsoft Press). 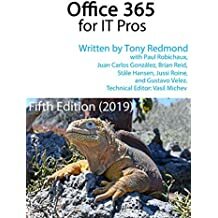 This is a two-volume project, where I wrote volume 1 covering the mailbox server role and high availability, while Paul Robichaux did a great job on volume 2, Microsoft Exchange 2013 Inside Out: Connectivity, Clients and Unified Messaging. The books have been available since October 2013 and have received a good response from the technical community, which is great. Exchange 2013 has not remained static since as Microsoft continue to push out cumulative updates on a regular (quarterly) basis. I am keeping the book content updated so that the updates will be covered if we have a chance to reprint. There’s always hope. My Exchange 2010 book for Microsoft Press was completed in 2010 (printed copies have been available since December 1, 2010). It’s still valid in most areas and I think that it presents a pretty comprehensive view of the product, but it has inevitably aged due to changes in the product since. Guaranteed to send anyone to sleep after two pages or less and covering the ins and outs of Exchange 2010 SP1, the book is now available at Amazon.com and all good online booksellers… see Microsoft Exchange Server 2010 Inside Out , also available at Amazon.co.uk . The book is also available in a Kindle edition . Other e-book formats for the book are available from the O’Reilly web site. I like the fact that O’Reilly provides access to five different e-book DRM-free formats that allow purchasers to read their books on the devices of their choice. It seems like a very liberating and worthwhile approach. A bundle of the Exchange 2010 Best Practices book and my Exchange 2010 Inside Out book is also available from Amazon.com. I continue to write for Windows IT Pro Magazine (you can click here to find my list of articles that have appeared in Windows IT Pro magazine over the years). Indeed, as and from August 2011 am writing a blog for Windowsitpro.com that covers topics relating to Microsoft Exchange Server. The advent of the Exchange Unwashed blog (for such is its name) means that I’ll be publishing less (or rather, different) Exchange content in the future in this blog, but I shall leave everything that has appeared to date intact for your reading. I’m also an MVP (Microsoft Most Valuable Professional) for Exchange. This video explains all about the MVP program. Have you considered to enable rss or atom feeds on your blog? It will make it easy to follow it. I understand that you and Paul Robichaux will conduct 2 “Mastering Exchange 2010” training sessions in October. My company is currently working with Exchange 2003, and we are going to impliment Exchange 2010. Currenty the physical server is on its last leg. And we are drastically running out of space, due to bad size policies and basically bad management (I have only been there for 4 months). Therefore we plan to impliment exchange 2010 in the next month. I would really love to attend your training, but I fear that by the time of your training we would have already implimented exchange 2010 (or would be in the advanced stages) . Are any of you having a similar a training session in September or you know of a reputable training instutuion? Paul and I are certainly open to the idea of running another event in Europe but the logistics just don’t make it possible to do so in September. Sorry! Maybe you can juggle your dates and come over to Boston ready to have your implementation plan challenged with some of the thoughts that we would lay on the table? I am please to say that I have registered for the course and I’m really really looking foward to it. Hoping to emerge from the training as an Exchange Pro 😉 !! Good stuff. The more that come along the merrier! I think that we’ll have a good crowd in both Boston and Anaheim and I am really looking forward to the experience. The only problem that we have is too much material! I shall be struggling to get through it all, but I guess that’s a good problem to have. Glad to see your mind isn’t that idle since leaving HP, Tony. Greetings from a “bad-penny” that turns up from your e-mail past and I’m glad to see you continuing in the limelight. Thanks for the advice about rugby for my cousin’s son. He is now playing for Biarritz’s junior team in south-eastern France. Drop by and see us if you’re in Valbonne. great book! As ever since your first book about Exchange 5.5. And I don’t usually retain IT Books, but yours are all in one row. And it was nice to meet you at the long gone Exchange Conference in autum 2000 in Nice. Hi Tony; do you happen to have a guide on how to move mailboxes and calendar items from gmail “apps for domains” to exchange 2010? I have MAPS and want to learn exchange the “easy” way…by installing SBS2011. 🙂 (You’d think that after 22 years in the IT industry as an admin I’d have learned something about exchange by now, but I guess now is better than never!) Currently we have about 5 gmail addresses that I’d like to move in-house, so it should be fairly straight forward. Great blog, mixing a couple of topics I’m interested in e-mail and rugby. Not your usual happy bedfellows but it works well. I followed your link to the Exchange 2010 Maestro Seminars above but it just says I don’t have access to the content on the Windows IT Pro site. I wondered if you are able to blog the details of the London seminar? Glad that you like the blog. As to the London seminar, I believe that the folks at Penton Communications are busy looking for the right location for the event. The last I heard, we are looking at a mid-June 2011 date. Stay tuned for more information. Tony, I purchased your book last week from Amazon (hard copy…who would pay more for Kindle edition when you get free access to e-version through Safari?). Thank you so much for giving 400-level information that MS doesn’t even document. I have a piece of helpful info for you related to command editing in PowerShell. On page 97 you talk about the F7 key and how it executes immediately, and how using the up/down arrows can be more convenient when wanting to edit the command before executing it. But you can do this with the F7 functionality by selecting the command you want and then pressing the right arrow key (instead of Enter). This adds the command to the prompt without executing it so you can edit it before pressing Enter. Just a note of appreciation. I was quite happy to see I was not the only one running on a laptop. I setup a 2008SP2 & Exchange 2010 environment on my laptop with a domain of mine at home to study for a job I really want at MS. I moved to Western WA 4 years ago working my way toward a job here where I would enjoy myself and have a great challenge and a team of people I enjoy working with. Typically reading is not my absolute favorite method of learning as real world experience is a much higher impact. 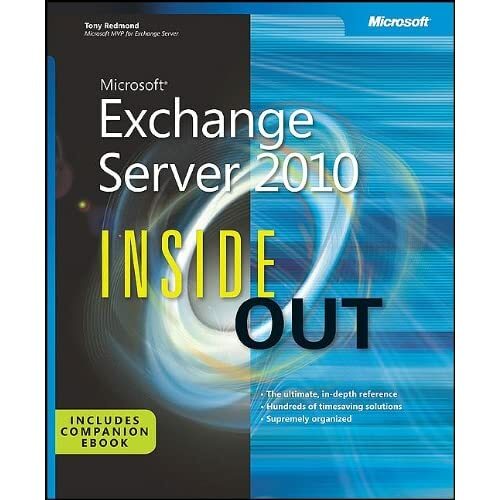 Thankfully Exchange Sever 2010 inside out is great for me to read keeping me moving and interested I can hardly get through it without needing to jump to the laptop to look into it and discover more. I enjoy the approach in the book personally. Hopefully I will see you in the future developing myself further into my dream job. I’ve been testing and starting Ex2010 SP1 administrative tasks are successfull using non-mail-enabled accounts. Could you provide me more details about your statement on the book? I’m assuming this is because of the RTM requisite to be mail-enabled in order use ECP? Please let me know. PS: Congratulations for your book. It’s a great source of information. Thanks for your kind words about the book. Tony, thanks for the quick reply! I’m trying to advise a scenario with mail-disabled administrators, so this is my last question: Could you mention any admin task that requires to be performed by a mail-enabled administrator in SP1? I really enjoyed your book and it was really useful during my studies for the Exchange MCITP exams. I am running into an scenario for which we haven’t been able to get a straight answer yet in order to solve the problem. We want to Block Unauthorized Devices (iphones,droids,tablests, etc.) from accessing OWA and caching corporate emails. We would like to use AS but we need to find a way to stop this type of unauthorized connections from happening. If you have time we would strongly appreciate your opinion about this one. To be clear, we’re discussing the need to stop users running a web browser on their phones to use the basic version of OWA to access their mailboxes. The technical answer is that there is no equivalent of ActiveSync device policies (which is what you’d need to block on the basis of device family or type). However, I suspect that this is a case where technology should not be used to address a problem that is simply bad user behaviour. If people are compromising corporate security by connecting to resources with unauthorized devices they should be warned about the consequences of this action and then penalized for a subsequent offence with disciplinary action, including (in my book) the loss of any ability to connect a mobile device by blocking their access to OWA (HTTP). You can argue that Microsoft should provide granular access to HTTP for mobile devices but I think that’s seeking to use technology to address an edge case. The vast majority of mobile access is through ActiveSync, which is designed for that purpose. OWA is designed for web browser access. OMA is being reintroduced in Exchange 2010 SP2 to provide a simplified browser access for mobile devices that cannot connect with ActiveSync, but I don’t believe that OMA comes along with the kind of granular access policies that you need. I have a “simple” question that I cannot find the answer to anywhere I’ve looked. Perhaps you’d be a sport and perhaps answer it? All I want to know is: How does Exchange 2010 store attachment files sent to multiple recipients? For example, I send an email with an attachment to 5 people. Is that attachment stored for each recipient (i.e. 5 times), or is a single instance stored and the 5 recipients simply get a pointer to the stored attachment. Would greatly appreciate any help/pointers/clarifications. Thanks! Simple answer to a simple question. Exchange 2010 made a change in its database schema so that all items belonging to a mailbox (messages and attachments) are stored in tables specific to the mailbox. In previous versions, Exchange used tables that were shared between the mailboxes in a database. The loss of the “Single Instance Storage” (where pointers are used to shared content) was felt to be a good thing because of the way that databases are used today. For more information, you can see Exchange 2010 Inside Out. You refereed a Clongowes – Blackrock SCT game I played in in 2000, which I though you managed extremely well. I always had one question about one of the decisions you made in the game; the ball was passed out from the scrum half to an outside runner at speed, the receiver didn’t get his hands up in time and the ball whacked off his shoulder and went miles forward. You waved play on. Is this not a knock on? Only joking, I never really saw you ref after that game and I always though you were a good ref so I was wondering what became of you. Just wanted to say that I found you a very fair referee who always allowed the game to be played if both teams wanted it that way. It’s good to also see that you have another one or two achievements to your bow. Thanks for the comment. I always enjoyed SCT games at Donnybrook (or Lansdowne Road) as outside European games, they were the hardest matches to referee if you had two quality teams on the pitch. Rock v Clongowes comes into that category! So hitting off a shoulder is like a ball going forward off your head – play on. What’s the spin and clarificaiton on this specific parameter and how it interacts with the other Calendar Repair Assistant parameters? CalendarRepairSchedule: Establishes a schedule when the CRA will check user calendars and fix any problems that it finds. If the CRA can’t finish during the set time, it will restart at the place where it finished the next time a scheduled window opens up. If no schedule is set, the CRA won’t run. The CalendarRepairSchedule parameter specifies the intervals each week during which the Calendar Repair Assistant applies checks for calendar failures. I think both say pretty well the same thing because the book implies that the properties are set through Set-MailboxServer (the example immediately preceding uses Get-MailboxServer to retrieve the properties). It’s the CRA that does any fixing that’s required. All we’re discussing is establishing a time during which the CRA can run to do the checks and fix anything that it finds wrong. It’s three years or so since I wrote that part of the book and it’s a while since I looked into the CRA in any depth, but I think that I’m right in saying that Set-MailboxServer -CalendarRepairSchedule has nothing to do with any fixing. CalendarRepairWorkCycle establishes a desired period during which the CRA should process every mailbox on a server. The example given is 7 weeks. Thus, whatever happens, CRA is supposed to get through every mailbox at least once per week. This is part of the overall move from Exchange 2010 SP1 onwards to have the background assistants operate on a planned “do this amount of work in that period” basis rather than the old approach of “keep working for this amount of time nightly”. I really can’t say that much more because I haven’t looked into CRA in any depth recently. It’s just one of those less important parts of Exchange – or rather, one that doesn’t get much respect. Tony, you wisely don’t have an email address for you anywhere on your site (that I can find), so I am posting here. You recently posted on WinIT Pro about the lack of context menus in EAC and you made a reference to a verbal faux pas you made at MEC 2000. I followed your link and read your past article on MEC from 2010. What I can’t figure out is why that is a faux pas. I have reread your paraphrased quote several times and can’t figure out what the mistake was. Was it because one or more words might have been misheard as something else, e.g., vulgarity? I took it exactly as I believe you intended: the audience was excited about feature that you only were mentioning but had no involvement in implementing, so you would tell the product team how happy everyone was. I must be overlooking something obvious if you immediately knew you may have erred. Vulgarity is the issue. Offering to give “the clap” to the Exchange development group might be construed to offer to engage in unsanitary behaviour… But what should I know about that? First I would like to thank you for the book Exchange 2010 Inside Out! I am on page 915 it and I wonder your chapter about Edge subscription. As far as I remember I was configuring Edge subscription some time ago (on 2007 and also on 2010) where I´ve had 2 EDGE servers and 2 HUB servers in place all in single site. I have to make two subscription xmls (on both EDGE servers and import those to each HUB) Otherwise subscription was working against 1 EDGE only. Is this correct approach? Once the subscription was made on 1 HUB only, there was no load balancing of incoming SMTP traffic. Are you talking about load balancing for incoming messages that should be handled by the two Edge servers? If so, shouldn’t you have your MX records pointing to the two Edge servers? If you’re talking about balancing the outgoing mail flow from the hub transport servers through the edge servers, this should happen automatically. At least, that’s how I think it should happen. At least, that’s what a quick browse of the Internet turns up at http://technet.microsoft.com/en-us/library/bb266920(v=exchg.80).aspx (applies to Exchange 2010 too). If this doesn’t work for you, you might have to log a call with Microsoft. I’m currently using a Transport rule in Exchange 2010 to allow 250 users to send/receive large attachments. I recently found the rule is using the RMS service and it requires an Exchange Enterprise CAL for each mailbox. Is their another way of doing this without having to purchase a Enterprise CAL? What is the rule and how is it using RMS? the transport rule uses RMS to send a rejection message “email exceeds message size limit 5.7.1” to all users except when the message is to/from a member of a distribution list. It was created by one my Engineers. I noticed the other day if you check any boxes on the Actions window when setting up a Transport Rule, Microsoft has a note at the bottom “Rights Management Service (RMS) is a premium feature that requires an Exchange Enterprise CAL for each user mailbox. I’ll discuss your rule with my engineer. I think that’s just a note to say that if you use RMS, you need an enterprise CAL. I see no reason for RMS in this case. I understand what your saying. I assumed RMS had been setup. I stumbled upon your work through Google Search and found quite a bit of useful information. The information you provide give a deep insight about tech products and services. Encompassing the detailed feature-set and evaluating the products on the grounds of sheer relevancy, your articles are read and trusted by a vast audience. I would like appreciate if you can have a look at our product. For a fair competency test of the product, we would gladly facilitate a product license key. If interested please let me know your email id so that i can mail you all other details. Sorry, but I don’t do product reviews unless I actually use a product. Thanks for making contact. we have noticed those messages never appear in the recipient mailbox or they are delayed for days..
Would you have any info about this “PROCESS” EVENT ID? Sorry. I’m unaware of the reason behind these entries. Sounds like a question to ask Microsoft. I would like to know about specific concept about reclaiming whitespace. When i move some 10 GB (assume 10 x 1 GB) of mailboxes from DB1 to DB2. Whereas the DB2 has 50 GB of whitespace, will exchange use this whitespace for the new mailboxes moved to DB2. I know for the existing mailbox growth on DB2 the whitespace will be used, but would like to know about the mailbox moved from other store to the target store (with whitespace) ? Exchange will use database whitespace for all transactions, whether they are messages generated by existing mailboxes or items in mailboxes being moved to a database. Just i was confused if the moved mailbox will occupy the whitespace in new DB. So this applies for all exchange 2003 and 20XX ? Yes, all moved mailboxes are treated as transactions coming into the Store and will therefore be dealt with like any other transaction. If white space is available, it will be used. Later versions of Exchange are more efficient and better at using this space, but the same principle applies. All of your Exchange books have offered informative details of the inter-workings of Exchange but the Inside Out: Microsoft Exchange Server 2013: Mailbox and High Availability goes a bit deeper into the store processes and I thank you for it. You always seem to have a inside-line to information that could come only from the development team and this book seems to have more than usual of these little gems. At any rate, I am thoroughly enjoying the book and I wanted to drop a note here before I added my comments on Amazon. Hope you are enjoying “retirement” and I look forward to your next one. A topic nobody seems to have discussed since Exchange 2007 is DB maintenance. Given E2013’s checkbox to run DB maint 24×7, is it still necessary to coordinate and customize DB schedules so they don’t overlap with each other? The reason why no one discusses this subject any more is that it’s all automatic. You don’t need to set up DB schedules because Exchange will auto-throttle the workload created by background maintenance so that it doesn’t interfere with other server activities. Without this kind of automation, can you imagine setting up DB maintenance schedules for a cloud service (Office 365) that has more than 100,000 Exchange servers? Thanks for the quick response! Yes, I kind of figured that but thought I would ask anyway. Tony, Haven’t seen any rugby posts in a while. Will there be any forthcoming? Alas, I have refereed but two games this season (both schoolboys) and am not very involved in the refereeing administration side either. I stepped down as a TMO some years ago to concentrate on other stuff as well. So I am sadly deficient on the refereeing front at present. Mr Redmond, My mind has been anything but idled. I work for a small Publishing company and we are heavy on the Macintosh equipment. We decided to start using the 365 for Mac which is wonderful “wait for it”….. except for an outstanding issue with Word. It crashes whenever you attempt to open a document create with a previous version of Word. Opening a .Doc file can cause the user “and administrator” 15 to 30 minutes of headaches each time someone attempts to open a .Doc file. Could you please please please ask your team why this hasn’t been “properly” repaired yet, and ask them to do so. Tony, I am reaching out to you in the hope that you can provide guidance on how we should go about quickly developing a Public Folder migration strategy/plan that makes sense for our firm. With all the noise in the marketplace about what to do, and the often times contradictory guidance from “expert” third parties, it goes without saying that we are confused about how best to move forward. I am not a technician, and we outsource IT. That said, I have a quite deep understanding of the topic and the pitfalls. We really do need to find a way forward before we have an event! We bought into the P F cool aid and let it grow unmanaged for years, and now we are nervous. Did you read the posts on the topic that are scattered around the network including this site? Or maybe listen to the TechEd sessions on the topic? Or do you plan to attend the Public folder migration session at Ignite? The first thing to do is to gather information about the potential workload, then you can focus in and make sense of it. In that Ignite is sold out, I will opt to view online. Yes, I have done very extensive reading on the subject, including your site. Maybe the challenge in all of this is finding the “better place” – how we get there will become evident once we decide on the better place. Is S P the better place? Archiving? Our requirements are like any other SMB firm. I was recommeded to you from someone I talked to at the recent ITDEV Connections Conference. Simple question. Can we change the name of the OneDrive Folder once it has been setup? The issue is that there is a limit on the number of characters that you can have in a path name. Over time people have discovered an issue with creating a structure in the One Drive Directory to maintain their files and they need to change the file structure to not run into this limit. I don’t beleve that it is a recommened practive to chante this once it has been setup as it would probably impact something else. What is your opinion on this? You’re probably referring to the 256 character limit in a folder name imposed by SharePoint (https://support.microsoft.com/en-us/help/3125202/restrictions-and-limitations-when-you-sync-files-and-folders). I don’t see an issue in renaming folders – I did this a moment ago by renaming a folder in a document library and the OneDrive sync client did the necessary and continued to synchronize. I also renamed a folder in my OneDrive for Business site and that was fine too. As always, do your own testing to confirm, but I don’t see an issue. Tony I have a stickler that may only be solved by the best of the best… This is why I would like to call on you for a quick answer… OR anyone else who ran into this unique issue. PF’s migrated to 2016 – again zero failures. Everything seems to work well until…..
All users loose connection to the Public Folders. The reason is KNOWN it is this…. Public folders use a second connection to the Exchange system to connect the user(s) to the public folder. This is proxied via an account that is created during the setup. In our case this is Mailbox1@….. The error is that the Mailbox1@…. address is reverting (i’ll explain below) back to an internal domain address that is not real nor internet viable – all users connect via internet – so this line in the “Test Email AutoConfiguration” tool of Outlook …. To fix it I open the advanced details of AD Users and Comps tool.. Open the details of the account Mailbox1 and change the attributes for mail addresses… I remove the wrong address and leave the proper one in – changing the smtp to SMTP. This fixes the issue and after about 40 minutes everyone can see the Public Folders once again…. UNTIL TOMORROW! where it reverts to having 2 smtp addresses again…. I have checked to ensure the rightdomain.com is the default domain. I have had Microsoft Support attempt to fix this now 3 times to no avail… All I need is how to make the address stick permanently so we dont loose connection in tomorrow and tomorrow and tomorrow again and again! If anyone has seen or knows how to handle this PLEASE let me know. Email me directly at coogrrr25 at gmail d0t c0m – public email address please dont set it up for spam! Thanks Tony and to anyone else who can assist in advance! Wow… Sorry I can’t help – this seems like a real special case. while formal cases to MS does not yet seems to help, I”m trying my luck with you as I know that you know it all 🙂 inside-out! we have users that are on in-place hold,everything,unlimited, their MB are on premises with online archive in cloud, Ex2013 CU17. so trying to find a way to migrate that data to online archive. found out that if a user MB is set to LitigationHold the data go to /Purges and that folder does move OK to online archive.